Black Seed Oil (Nigella Sativa) Cures Everything? - Anti-Age Naturally! Black Seed Oil (Nigella Sativa) Cures Everything? Recently, after a dinner out, my fiancé and I were driving home and we decided to take a detour past our new home to be, to check out the area. I spotted a grocery store and asked to stop for something sweet. The minute we entered we noticed that it wasn’t your typical grocery store. It was so unique. There were miniature trees with fruit, there were bags of rice piled high and weird vegetables I never knew existed. I felt like we were in a different country. We were so excited to see all the different meat signs, signs we didn’t understand, and aisles with lots of foods we never heard of. The first things I started piling in the grocery cart were tea’s – there were so many different types of ginger teas, which happens to be my new favorite tea (I will write more in a future article). After the tea aisle I couldn’t help but to head to the beauty aisle. And, to my surprise, there were many oils in the beauty aisle – not normal for an American grocery store. I was so excited to see oils that I had only read about. I purchased several. But today I want to dedicate this article to the black seed oil. You see, black seed oil is an amazing oil that has been brought to my attention time and time again throughout my research. It has an amazing amount of health benefits and I was excited to see it. 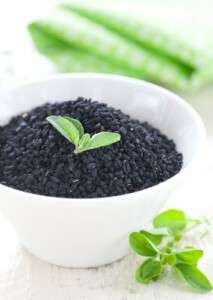 Native to Asia, black seed oil comes from the Nigella Sativa plant also known as black cumin. This oil has a rich history as it was said to have been used by Cleopatra for her skin and hair. It was also mentioned in the old testament as a spice for cakes and bread. The list goes on for many of its herbal remedies. It is said that only worthy things were found in King Tut’s tomb. Black seed oil happened to be one of them. So, why was this oil so revered? Does it really have healing powers? Does science agree with Egyptian royalty? Well, I’m happy to report that I have read dozens and dozens of studies that confirm what our ancestors already knew. But we now know the reason black seed oil is so powerful. It’s because it contains three very potent chemicals – thymol, thymoquinone and thymohydroquinone. Their properties collectively are antibacterial, a fungicide, antibiotic, antioxidant and antiviral. It means that black seed oil is a total powerhouse against all types of diseases. I have been astounded and impressed by its many uses and claims. There are so many studies and the research is promising (over 786 studies published just on Pubmed). And the research continues because black seed oil is proving to be able to fight superbugs. In fact researchers at the Department of Pharmacy, University of Dhaka, Bangladesh, conducted a study of black seed oil against five different antibiotics. The oil proved more effective against many strains of bacteria, including those known to be highly resistant to drugs. Possible side effects of black seed oil are low blood pressure, low blood sugar and it may slow blood-clotting. Most experts recommend taking a teaspoon of the oil two times per day on an empty stomach. You can also mix it in your beverage of choice. You can apply topically or add a teaspoon to your favorite moisturizer for skin conditions. So, whatever your reason to try black seed oil, make sure you purchase organic, pure-pressed without chemicals or additives. If you want to know more, feel free to send me an email. We’ll learn together. For a healthy more beautiful you! P.S. If you can’t find black seed oil I really like this one – it’s the purest that I’ve found online. James A. Duke, Et. al. Medicinal Plants of the Bible. 2008. Amin B., et. al. Black Cumin (Nigella sativa) and Its Active Constituent, Thymoquinone: An Overview on the Analgesic and Anti-inflammatory Effects. Planta Med. 2016. Ivankovic S, Et. al. The antitumor activity of thymoquinone and thymohydroquinone in vitro and in vivo. Exp Oncol. September 2006. Yi T, Et. al. Thymoquinone inhibits tumor angiogenesis and tumor growth through suppressing AKT and extracellular signal-regulated kinase signaling pathways. Mol Cancer Ther. July 2008. Ola M Omran. Effects of Thymoquinone on STZ-induced Diabetic Nephropathy: An Immunohistochemical Study. Ultrastruct Pathol. October 2013. Murli L. Mathur, Et. al. Antidiabetic Properties of a Spice Plant Nigella Sativa. Journal of Endocrinology & Metabolism. April 2011.